Parking in Puerto Rico can be a bit of a nightmare sometimes. This can be complicated even further if you don’t know Spanish and can’t read the street signs. Either way, you can make your parking experience in Puerto Rico easier if you read the following guide about the best places to park in the most popular spots. Taxis can get expensive and often have inconsistent pricing. Rentals can be pricey as well. That’s why you should ship your car to Puerto Rico if you are staying for any sort of extended period of time. 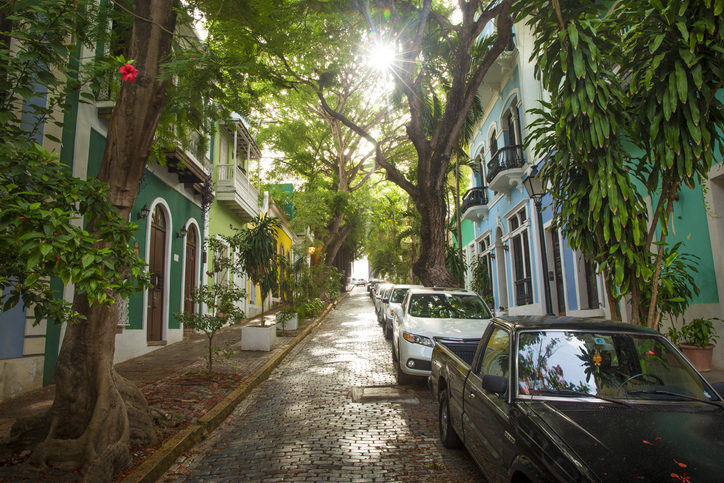 It is nearly impossible to find parking in the heart of Old San Juan. You could end up spending hours looking for parking and still not find one, depending on when you are looking. Although, Old San Juan is definitely a sight you will want to see when you are in Puerto Rico. So, how can you find parking in Old San Juan? Free parking on the street – if you wake up early in the morning, namely on the weekend, you should be able to find free street parking somewhere. Just be prepared to spend some time looking, to have to walk several blocks after you park and be prepared to lose your spot immediately after you move your car later on. Parking Garages – these are likely your best option. They really are not that expensive, and you will have “come and go as you please” access to your vehicle. Paseo Covadonga – located at 104 Paseo Covadonga, San Juan, Puerto Rico, you can park for only a dollar an hour. They do close during the week between midnight and 6 AM but are open twenty-four hours on the weekends. Estacionamiento Doña Fela – located at Calle Recinto Sur, San Juan, this garage is open twenty-four hours a day, seven days a week. The rates are a dollar and fifty cents for the first hour and fifty cents for every additional hour after that. They also have a “nightlife special” where you can park for twelve hours from 6PM to 6 AM for only three bucks. Entry off Calle Norzagaray – located in Calle Norzagaray, under Plaza del Quinto Centenario, this garage is yet another solid choice for your parking needs. It is open twenty-four hours, seven days a week. They charge two dollars for the first hour of parking, and another dollar for every hour after that. La Cochera Parking Garage – located at 204 Calle de la Luna / 205 Calle San Francisco, this garage is also open twenty-four hours, seven days a week. Rates are a little more steep at five dollars for the first hour and four dollars for every hour after that. Parking lots – many of these feature valet parking. They are a fairly inexpensive alternative to the stress of looking for free parking on the street. La Puntilla Parking Lot – located at Calle Presidio & Paseo de la Princesa, this parking lot only charges a dollar and twenty-five cents for the first hour, followed by fifty cents every additional hour. They do, however, close at 10PM during the week. Old Sheraton Hotel Lot – located at 100 Calle Brumbaugh, you can park here for a twenty-four-hour period for just under 22 dollars after taxes. Call ahead to ensure there is room for your car (787) 721-5100. Isla Verde is another gorgeous Puerto Rican sight that you won’t want to miss during your time in Puerto Rico. However, just like much of Puerto Rico you will likely have a difficult time finding parking here. Don’t worry though. There is easily accessible parking available here too, so long as you are willing to pay a few dollars. So, how can you find parking in Isla Verde? Free parking on the street – as this is quite a popular tourist area, finding free parking on the street is exceptionally difficult. You will need to wake up at dawn and hope there is a spot available. We don’t recommend even attempting this in this area. Parking Garages – there are also a bunch of garages in this area. They are a great option because you can spend a couple bucks to have your car safe and sound in the safety of the garage while you enjoy the incredible beaches in this area. 6063 Isla Verde Avenue, Carolina – located at the same address of its name, this garage is open twenty-four-hours a day and seven days a week. The rates are quite reasonable at sixteen dollars a day for the self-parking option or just over twenty-one dollars a day for the valet parking option. If you want to go with an hourly rate for shorter stays, the rate is three dollars and fifty cents for the first hour and two dollars and fifty cents for every hour after that. 7012 Boca de Cangrejos Avenue, Isla Verde, Carolina – also located at the same address of its name, this garage and lot combination has a bunch of different options for you to choose from for all of your parking needs. Self-parking runs fifteen dollars a day, valet costs twenty dollars per day and hourly is three dollars per hour. 6961 Ave Gobernadores, Isla Verde, Carolina – located at the same address as its name, this garage and lot combo is open twenty-four-hours and seven days a week. Self-parking costs seventeen dollars per day and valet parking costs twenty-five dollars a day. You do, however, need a reservation to park here. So, be sure to call them ahead of time at (787) 253-1700. Public parking lots – these are nice and cheap and usually have many spaces available. Some are not open very late though. But, if you’re just visiting the beach, that shouldn’t pose an issue. Balneario de Carolina – this lot is located just east of Pine Grove Beach along PR-187, slightly north of the San Juan International Airport. It only costs four dollars per day to park here but is only open from 8AM to 5PM on Tuesdays through Sundays. 1, 3 Calle Dalia & Rt. 187, Isla Verde, Carolina – located at the same address of its name, this parking lot is open twenty-four-hours and seven-days-a-week. You can park here for the standard rate of a dollar and twenty-five cents for the first hour and seventy-five cents for every hour after that or you can pay eight dollars a day for valet parking. This is yet another gorgeous area that you will want to make a stop at sometime during your stay in Puerto Rico. Believe it or not, parking on the street isn’t so bad here but we will go through all the available options just in case you do happen to choose a busy day to visit. So, how can you find parking near Ocean Park Beach? Free parking on the street – as we just mentioned, it is actually quite possible to find free parking on the streets in this area. In the end you will likely end up finding a spot, you might just have to end up walking for several blocks to actually get to the beach. However, if you end up driving around for over twenty minutes or more, we recommend cutting your loses and choosing one of the lots which you can read about below. One of these free lots is located on the west side of Barbosa Park near Calle Soldado Serrano. There are two free parking lots on the northern side of Barbosa Park, directly across the street from the beach, near Calle General Patton. There is another free parking lot on the east side of the park, at the tennis courts, over on Avenida Las Americas. If you are looking for parking near this airport, there are some great and affordable options available. Maybe you are going on vacation somewhere for a few days, maybe you are just visiting somewhere for a night or two. Either way, the rates near this airport are very reasonable. So, how can you find parking near Isla Grande Airport? Parking at the airport – it will cost you just under nine dollars a day to park here. Be sure if your car will be there for anymore than three hours that you go with the full-day rate which will be cheaper than leaving it there with the hourly rate. Other options – Estaciona Y Vuela – this park and fly will let you park for only nine dollars a day. It is also open twenty-four-hours a day and seven-days a week. It also offers the comfort of knowing that it is a high security facility which is equipped with many security cameras. Another great area in Puerto Rico, especially for tourists, Condado and Puerta de Tierra is another must-see sight while you are in PR. This city is full of some great casinos and many other fantastic tourist attractions. So, how can you find parking in Condado and Puerta de Tierra? Parking Garages – there are a ton of parking garages here. Some are more expensive than others. However, some may offer better hours, service or security. So, be sure to do your homework. Ashford Avenue right across from the Condado Plaza Hilton hotel – this parking garage is open 24/7 and has great video surveillance. The rates are three dollars and seventy five cents for the first hour and then two dollars and seventy five cents for every hour after that. 999 Ashford Avenue, Condado, San Juan – this parking garage is also open twenty-four hours a day and seven days a week. The rates are also three dollars and seventy-five cents for the first hour and two dollars and seventy-five cents for every additional hour after that. If you are staying at the hotel, then you can park there for less than twenty dollars a day if you please. 1018 Avenida Ashford, Condado – this garage is open 24/7 and the rates are two dollars and fifty cents for the first hour then a dollar and fifty cents for every additional hour after that. 1077 Ashford Avenue, Condado – this parking garage is also open twenty-four hours a day, seven days per week. Non-guests of the hotel can park in this garage for five dollars during the first hour and for four dollars for every hour after that. Hotel guests can park here for fifteen dollars per day. 1309 Ashford Avenue, Condado – the hours here are 24/7. However, the hourly rate is pretty steep at almost nine dollars per hour. It’s much cheaper as a guest at only eighteen dollars per day. 1369 Ashford Avenue, Condado – this garage is open 24/7. The hourly rate can get fairly expensive though. For non-guests of the hotel the rate is eight dollars for the first hour but only four dollars per hour after that. Hotel guests will only have to pay just under thirteen dollars per day for parking. If you are parking on the street, make sure you only park next to curbs with no coloring. A blue curb means it is a handicapped spot, a red curb means it is a fire zone and a yellow curb means that it is a taxi pick-up and drop off only. If you use metered parking, make sure to keep your meter fed. The fine for an expired meter is thirty five dollars and parking enforcement can be vigiliant. Metered parking is marked with white and yellow signs that read “Estacionamiento Pagando Metro”. Remember, you must wake up as early as possible if you want to have any chance of getting any free street parking. Even if you do go out early looking for parking, there is a chance that you might not get any. Parking in the various areas of Puerto Rico can be pretty confusing and difficult. There are never any guarantees that you will find free parking along any streets. However, you should always keep a look out for parking lots and garages. Many of these are quite affordable as well. Some lots may even be free of charge.